Causes of loose skin, stubborn fat and diastasis recti. What a tummy tuck can do. What BMI do I need to be for a tummy tuck? Do I need a tummy tuck for a bulging stomach without loose skin or fat? How much does a tummy tuck in Canada cost? What is the cost of a tummy tuck in Ontario? What is the cost of a tummy tuck in Canada? Flatten and toning your mid-section is harder than it sounds. Dr. Kasrai customizes your tummy tuck to give you beautiful looking results. She applies a technique that gives you a faster, more comfortable recovery. It's not your fault that you haven’t had any success firming and toning your midsection. You've tried time and again to get rid of stubborn fat and loose skin. Despite diligently following a nutritious diet and exercise plan, you’re still longing for the flat, toned tummy you used to have — when you were younger or before you had children. Who’s to blame? Not you! I would like you to know that these issues with your appearance probably can't be fixed by following a healthy lifestyle alone. Often, outside factors, such as the aging process, hereditary traits, major weight loss and/or pregnancy are to blame. As you get older, your body gradually stops producing collagen and elastin. These are two proteins that are essential for healthy skin. Without a good supply of collagen and elastin, your abdominal skin weakens and becomes less elastic. This makes your skin unable to "bounce back" to a smaller size or shape after pregnancy or when you've lost a lot of weight. On top of that, pregnancy can also cause your abdominal muscles to separate or become severely weakened. This condition is technically known as diastasis recti, and makes your stomach bulge as if you were still pregnant. So, don't blame yourself for being unable to tone up your stomach because these are issues beyond your control! Watch Dr. Kasrai in this you tube tummy tuck video. That means you can get the toned tummy you used to have! Plus, your healthy lifestyle after surgery will ensure that your results are maintained for a long time. Many surgeons tell their patients that they should be at a normal BMI (Body Mass Index) before considering surgery. 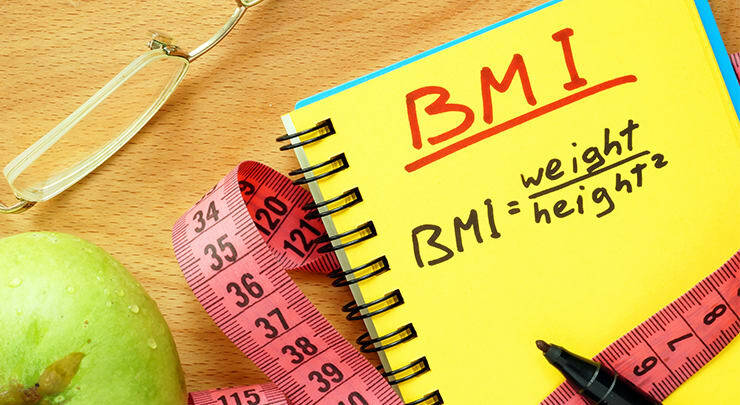 To calculate your BMI, only your height and weight are measured. I do not support this. I believe BMI is an inaccurate method of measuring someone's ideal weight because it doesn't take into account other factors, such as your bone structure or how muscular you are. I have had patients who were denied surgery because they were considered "overweight" and even "obese", when in fact they were healthy and at their ideal weight. I performed surgery safely on them and they were able to achieve the improvement they wanted. For this reason, I do not use BMI as a way to pre-select patients. I always meet with each patient first and examine their physical health and medical history before determining whether they are a suitable candidate. Tummy tuck is an outpatient procedure. This means that you won’t need an overnight stay unless it's necessary. Most of the time, the surgery takes about three hours to perform, although it depends on the complexity of your situation. It can be shorter or longer. For example, your surgery may take longer if I need to perform liposuction first to remove surplus fat. This technique is also known as lipoabdominoplasty. Other factors that contribute to the length of your surgery include the amount of excess skin/fat that needs to be removed and whether your abdominal muscles need to be repaired and to what extent. Prior to the start of your surgery, a board certified anesthesiologist administers general anesthesia. For this reason, you won't feel anything and are completely comfortable throughout the entire duration of your surgery. A horizontal incision across the pubic area is created, extending from one hipbone to the other. However, the incision won’t be too long because I make sure to position it in a region that can be easily covered by your underwear or bikini. That way, you won’t have to worry about other people seeing your tummy tuck scar when you wear certain clothes. I separate the tissues from the underlying muscles and repair your abdominal muscles. To do this, I strategically place internal stitches in your stomach muscles, which run vertically from the pubic bone to the ribs. These stitches hold your restored abdominal muscles in a tightened position, so they don’t bulge. If you don't have diastasis recti, then this won't be necessary for me to do. I rejoin the muscles and tissues (often with the use of additional internal stitches). Loose excess skin is removed before the remaining skin is pulled taut. The location of your navel is aligned with your new, svelte abdominal contour. It's important that the amount of skin tightening is accurately measured for each patient. For example, if you have a larger frame and too much skin and fat are removed in your mid-section, your stomach may look fine on its own but the overall result will look strange because it won’t complement the rest of your body. Basically, it'll look like you have someone else’s stomach on your body! For this reason, I always look at your mid-section in relation to the rest of your body. Finally, I close the incision with sutures before dressing the treated area with bandages. That will leave you with a horizontal scar and one that's less visible around the belly button. It is only in very rare cases that a vertical scar from the belly button down is present as well. A tummy tuck compression garment may also be put on for added support. Please continue to wear your compression garment until I advise otherwise, since it is necessary for your healing process. Don't be discouraged, because it is possible to have a leaner body contour. Unique point for faster recovery after abdominoplasty: you don’t need drains! extremely uncomfortable: imagine trying to rest with tubes hanging out of your body! difficult to handle: the tummy tuck tubes need to be kept in place so you have to be extra mindful of their presence. troublesome to keep clean: the tubes need to be drained daily to keep them working properly. a factor that contributes to infection: the abdominoplasty drains are placed through open incisions into your body, and these open wounds are highly susceptible to infection. Tummy tuck drains prolong recovery because of these open wounds. You’ll be relieved to know that I do not usually use drainage tubes. Instead, I use a series of internal sutures to hold the remaining tissues in place before closing the incision. Doing so reduces much of the empty space where fluid tends to accumulate after surgery. With very little or no empty space, the risk of fluid accumulation is decreased. That’s why generally you won’t need any pesky, uncomfortable drainage tubes. You may know this as a drainless tummy tuck or no-drain tummy tuck. You’ll be able to focus on your recovery better in more comfort, and see your results faster. Once the effects of the anesthesia have worn off, you are discharged into the care of the person you’ve authorized to help you. This person or another responsible adult should stay with you the initial night following your surgery. They'll be able to help you since you'll probably find it difficult to perform even the simplest of tasks alone. Recovery after tummy tuck: how long is recovery from a tummy tuck with or without liposuction? You will need to arrange to take about two weeks off from work or your everyday activities after your tummy tuck surgery Toronto. During this time, you should rest while your body heals. Avoid heavy lifting and other strenuous activities. This is particularly important if you've had a tummy tuck with muscle repair and lipo. On the other hand, you should take several short walks around the house each day to help prevent blood clots from developing in the legs. You may need help from someone to get around in the first day or two after tummy tuck surgery. Tummy tuck day 1: You'll feel quite sore and tired. Rest and move about very slowly. When bathing, you should have some help. Pain may be at its worse now. Tummy tuck day 2: Your energy level will be a little better, but you'll still feel a little stiff and tight. Swelling may be getting worse at this time. Tummy tuck recovery day 3 (tummy tuck post op day 3): You'll feel less tired but still sore. Pain medication can help. As your energy returns, make sure you still take it easy! Tummy tuck 4 days post op: You'll be able to do most things on your own now, but don't strain yourself. Continue to bend over a bit at the waist to avoid putting tension on your incisions. Tummy tuck 6 days post op: Swelling continues to get worse. Move around a bit to keep your circulation going. 8 days post op tummy tuck: by this time, you'll start noticing that the swelling is just starting to go down. You'll also be in less discomfort. In the days following, bruising and swelling will gradually disappear. Pain and discomfort also disappear. How long wear compression after tummy tuck? You'll need to wear your compression garment for tummy tuck for a few weeks. The exact time will be included in your post-op instructions. The compression garment should be tight but not painful or suffocating. A note to moms: I tell my patients that they should treat their recovery like it's the best vacation of their life. Being a mother myself, I know you might feel a little guilty for taking so much time off for yourself. You've dedicated your life (not to mention your body!) to your children, and you deserve to do something that will make yourself happy, too. So, kick back, and relax! Besides, this is a great time to spend some precious time with your children, as well, because you can't go rushing off to work, cook or do whatever else you have to do to manage your household. The treated area may be numb, tender or sore. You can take oral pain medication as directed to relieve any postoperative pain or discomfort. Any stitches in the stomach tuck area will be removed about two weeks after surgery at one of your follow-up appointments. You can gradually resume your normal routine, including your exercise regimen, as advised. Although surgical complications are uncommon, you can do your part to minimize any inherent surgical risks by following all of my pre- and post-operative tummy tuck after care instructions closely. I’ve designed these instructions with the ultimate goal of achieving a speedy recovery for you. Your care instructions include avoiding smoking for several weeks prior to and following surgery. Smoking inhibits proper healing, increasing the risk of complications such as infection. It can also lead to a longer, drawn out recovery . Your incision scar will appear pink or red at first. As time passes and with proper care, the tummy tuck scar tissue will fade to almost the colour of your skin, making it dramatically less noticeable. I understand that scarring is a huge concern. I will provide specific instructions on how to care for your scar so that its visibility is minimized when it's fully healed. This will reduce the risk of a hypertrophic tummy tuck scar. Most of our patients don't complain about their scars since they fade so much, so no scar treatment, therapy or silicone sheets are necessary. You’ll notice a flatter abdominal profile immediately after surgery. However, your aesthetic results will continue to improve over the course of about six months, as your body heals and swelling subsides. Once you’ve healed, you may be pleased to see that you have a flat stomach and even possibly a "six-pack”. What is abdominoplasty? What is tummy tuck surgery? Abdominoplasty, familiarly known as a tummy tuck and also spelled abdominalplasty, abdominal plasty, abdominoplast and adominoplasty, is a cosmetic surgical procedure that firms up the mid-section, making it leaner and more "cinched in". It flattens the stomach and gives you a more defined waist. Muscular definition of your abdominal area may also be improved. Most of our patients have a tummy tuck after kids. Do I need a mini or full tummy tuck in Canada? This is a question that can only be answered by seeing me in your initial consultation. I'll assess your mid-section, quality of skin and shape to determine which technique will adequately achieve your goals. Generally speaking, however, a full tummy tuck Toronto tends to be more popular than a mini. I don't have much loose skin or fat, but I still have a bulging stomach. Can I still get a tummy tuck? Loose skin and excess fat aren't the only reasons why your stomach may bulge. Diastasis recti, a term that refers to a vertical separation of the right and left abdominal muscles, may also cause bulging. A tummy tuck Toronto can be performed to correct this, even if you don't have loose skin or excess fat. Can I just get a tummy tuck skin only removed? Yes, you can get a skin only abdominoplasty if you have enough loose skin to remove. How can I tighten tummy skin without surgery? Is there a surgery free tummy tuck? Unfortunately, it is very difficult if not impossible to tighten up belly skin without surgery. There are nonsurgical options, however results aren't as predictable. Can I just get a tummy tuck no muscle repair? 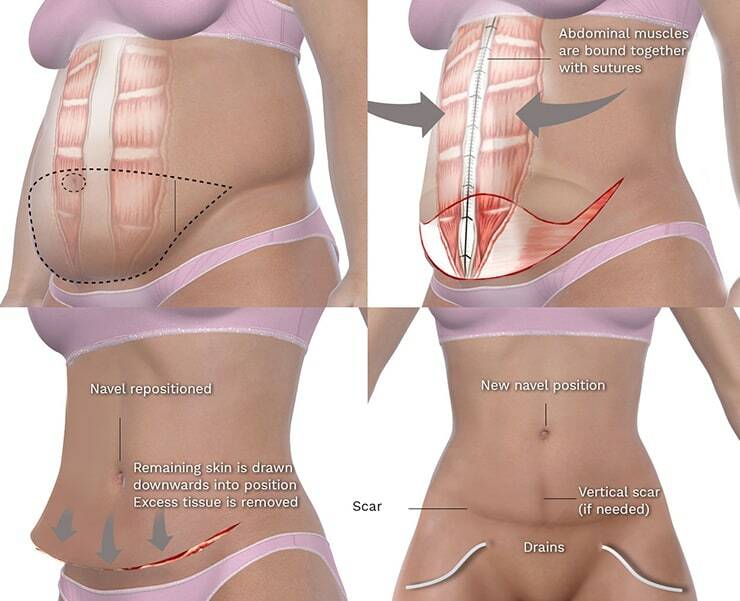 Yes, if you don't have diastasis recti, then you do not need muscle repair during your abdominoplasty Vaughan. Why can't I just get liposuction? Liposuction is designed only to remove excess fat. It does not adequately tighten up the skin, despite claims by some liposuction devices and surgeons. To tighten up the skin, excision is necessary and that's what a tummy tuck is for. How much does abdominoplasty cost in Toronto, Ontario, Canada? How much is a tummy tuck in Toronto? How much is a tummy tuck in Ontario? The price of a tummy tuck is set by the individual surgeon. Generally, the abdominoplasty cost Canada ranges from $7500 to $9500 in Toronto. The lower end is for a mini tummy tuck without muscle repair and the higher end is for a full tummy tuck. The cost of tummy tuck Canada usually includes surgeon's fees, anesthesia, surgical facility, staff, pre- and post-operative appointments as well as compression garments after tummy tuck surgery, if they're necessary. If you gain weight after a tummy tuck, your results may be negatively affected and you may lose your toned stomach. Please follow a healthy lifestyle to maintain your results. What happens if I get pregnant after surgery? Can I have a baby after a tummy tuck? Can you have kids after a tummy tuck? Like weight gain, your results may be negatively affected if you get pregnant after tummy tuck. This is true with pregnancy after tummy tuck with muscle repair or without. I always recommend that women should consider a tummy tuck only after they've stopped planning to have children. In fact, a tummy tucks is a common surgery after childbirth. Can I get rid of stretchmarks with a tummy tuck? A tummy tuck to remove stretch marks is commonly requested. Usually, stretchmarks located below your belly button may be removed, but often not in their entirety. Stretchmarks located well above the belly button at the top of stomach or on your waist may not be removed. What happens if I don't stop smoking before a tummy tuck? You'll be at a higher risk of developing complications, including delayed healing, infection and necrosis. I will tell you where you can expect to have scars before your surgery. Usually, they're placed very low, so they remain hidden by underwear or a bikini. A tummy tuck without scar is impossible, however, the abdominoplasty scar will be invisible while wearing clothing. Is a tummy tuck painful? How painful is tummy tuck recovery? A tummy tuck stomach can cause more discomfort than other procedures, and this is particularly true if muscle correction is performed. Pain medication will be prescribed to help you ease discomfort in the first few days. As one of the top tummy tuck surgeons in the country, I can say that if you're considering a tummy tuck Ontario as a way to lose weight, then you are not a suitable candidate. A tummy tuc is best performed on patients who are at a healthy stable weight. Am I a candidate if I have a high BMI? I don't use BMI as a way to determine who is a candidate for the surgery because I believe it is an inaccurate method of measuring weight. I always examine a patient's unique body type and concerns instead. Drains are long tubes inserted into the treated area to allow for excess fluids to flow out of the body. Many plastic surgeons use them to lower the risk of seroma/hematoma. However, most patients prefer tummy tuck without drain tubes because they are uncomfortable and bothersome. Fortunately, I don't place drains for my patients because I apply unique suturing techniques that make them unnecessary. This is a feature that doesn't affect the tummy tuck cost Canada. Drainless tummy tuck complications are lower and I've found that the benefits of having no drains after tummy tuck often outweigh the drawbacks. What tissues make up the stomach? The tissues of the stomach and mid-section that are targeted during a tummy tuck are skin, fat and muscle. The cost of a tummy tuck in Ontario depends on the individual surgeon. It usually ranges anywhere from $7500 to $9500. The fee generally includes surgeon's fees, anesthesia, surgical facility, staff, pre- and post-operative appointments as well as an abdominoplasty compression garment. The facility may be at a hospital or private surgical facility. The price of a tummy tuck is set by the individual surgeon. Generally, the abdominoplasty cost in Canada ranges from $7000 to $9500. You may find that smaller towns charge less. The lower end is for a mini tummy tuck without muscle repair and the higher end is for a full tummy tuck. This cost usually includes surgeon's fees, anesthesia, surgical facility, staff, pre- and post-operative appointments as well as compression garments. Please follow the care instructions I've designed for you. These will help you to prepare for your surgery and recover afterward, allowing you a safer and more effective experience.